Running Time: 19 x 13 min. Circleen is a little elf who sleeps in a match-box on the artist’s desk. She helps her to tidy up, and her best friends are the mouse couple Frederic and Ingolf. 19 shortfilms of 12-14 min were produced for the DR in the years 1967-71. “Oh, what a lovely birthday” was the first colour production shown in DR in 1968, while the last one, “Circleen in America” (1971) had strong, political undertones and was never broadcasted. 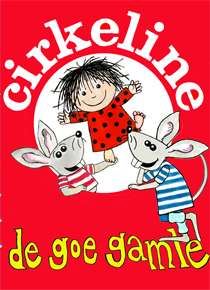 However, due to frequent reruns in DR and a broad non-commercial distribution in the years following, Circleen became a wellknow and beloved character. In 1998-2005, three features with Circleen were produced and following her popularity boomed. Several books have been published, a wide range of merchandise is produced and in 2010, Circleen and Ingolf will be TV-host in DR’s weekly program, Fandango. In Denmark Circleen has a recognition close to 100%. Several of the songs from the Circleen series are classics – e.g. Cirkeline, Cirkelines fødselsdag, Bim, Bam, Busse and Snemusen Knud.